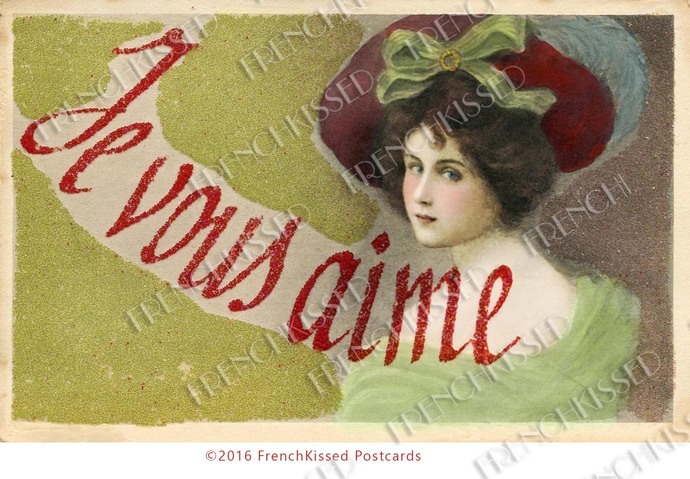 My original antique French postcard, mailed in 1905, is covered in petite glass beads. I applaud the person who wrote the French script "I love you" in red glass beads. Overall, the glue and beads have survived the passing century quite well and while the printed version doesn't look as 'beady' (on my copy anyway:) it does give the image a nice textured look. I spruced up the lady with some paint and powder and Photoshop. 300 dpi Jpeg Photo at about 5.5 by 3.5 inches (typical antique postcard size).